June 2014 : Defense Fab - E-FAB, Inc. Contact E-FAB for a sales quote today. Supporting hybrid and microwave circuits components manufacturers for the defense and military industries. 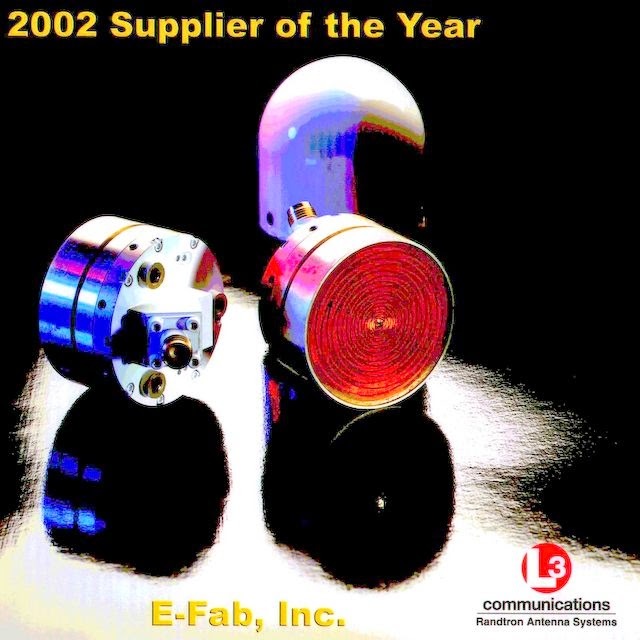 E-FAB is a key supplier for all types of microwave and RF component flanges, plates, bases, frames and carriers. Click link to send us your engineering files or request a sales quote. 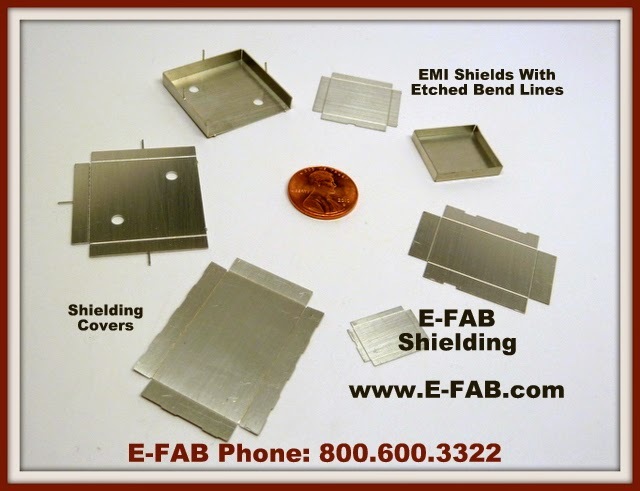 Contact E-FAB for a shielding quote today. PCB EMI cans and cages are able to be fabricated and custom formed into complex shapes and designs, using various types of metals and alloys. EMI lids and covers can be custom designed to be easily removable, with built-in clip detents and/or dimples and/or holes in the cans for clipping the lids in place. Click link to request a sales quote. Contact E-FAB for all your PCB Stiffener and high power Busbar needs today. 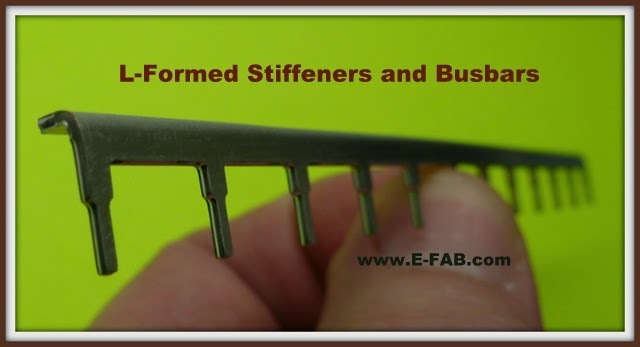 E-FAB stiffeners and busbars are ideal for PCB stiffening for rugged and harsh-environment and military electronics' products and can be custom designed to meet various customers’ circuit board requirements including straight, bent and formed; to curved, single layer and snap-in styles, including multilayer busbars capable of carrying high currents on multi-voltage busses on PCB boards. Click link to request a sales quote. 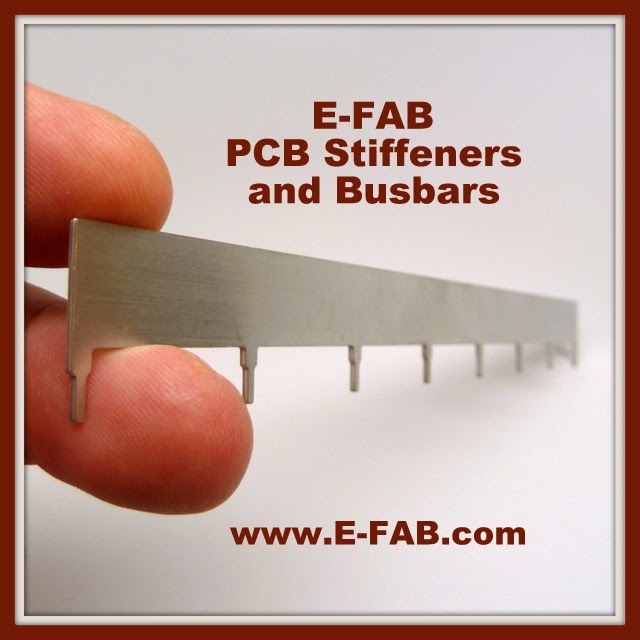 Order the E-FAB Stiffeners and Busbars Sample Kit Today. 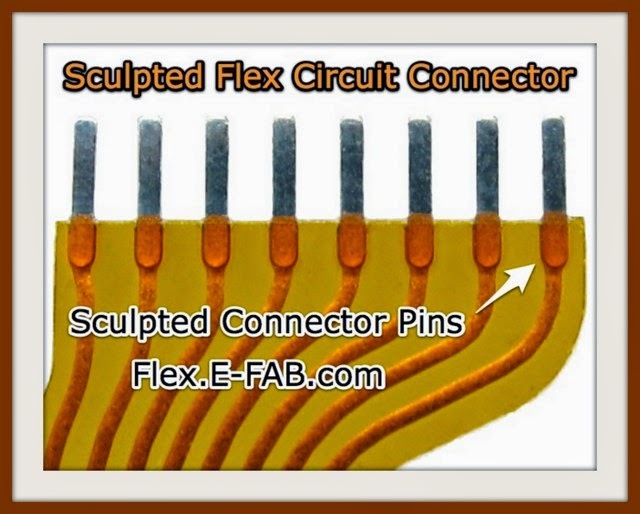 Sculpted flex, also known as sculptured flex circuits, have raised surface features. 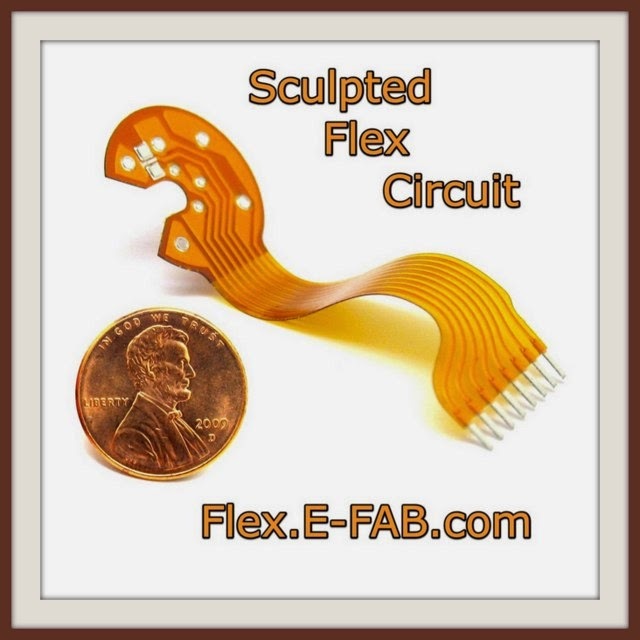 Contact E-FAB for Hybrid Flex Circuits and Sculptured Flex Circuits sales quotes today. Close up pictures include front view, connector end and surface raised features of a sculptured flex circuit. The raised connector pins are built directly into the flex circuit, which effectively eliminates the requirement to install install expensive ZIF connectors on the mating circuits, since the finished pin thickness on the flex board can match that of almost any engineered connector requirements. Click link to send us your engineering drawing and request a sales quote. Contact E-FAB for Micro Bumps contact points and micro cavities sales quote today. With E-FAB's precision micro bump forming process, we have the ability to produce precision bumps, contact points, on various metals and alloys. E-FAB micro bumps (contact points), micro divots, cavities, depressions, or precision dimples are ideal for special applications requiring raised bumps, miniature contact points, spring contacts on thin metal parts, or raised contact points on stand-alone trace circuits. Click link for a sales quote or speak with an E-FAB engineer in regards to your special application needs. 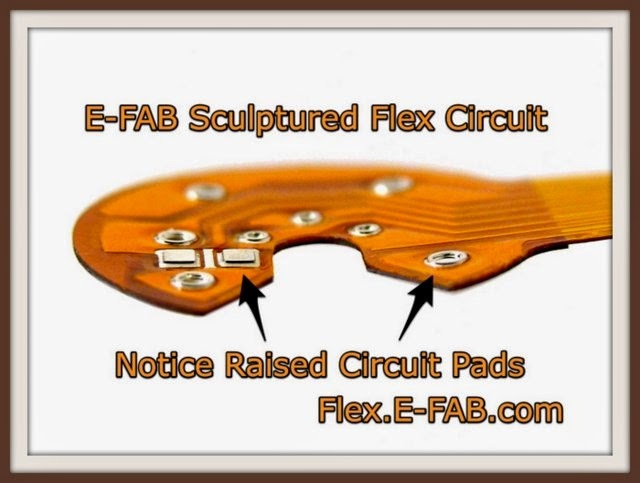 Contact E-FAB for Micro Contacts. Contact E-FAB for your Antenna Fabrications sales quote today. E-FAB manufacturing of antenna systems includes: micro, macro, cone, horn, helix, spiral, patch, hybrid etched antenna arrays, cavity backed, phase array, fractal, blade, miniature parabolic, rigid & flexible antennas on various substrates. Click link to attach your engineering drawings or request a sales quote.